Discussion in 'Sevenstring Guitars' started by LeviathanKiller, May 27, 2017. 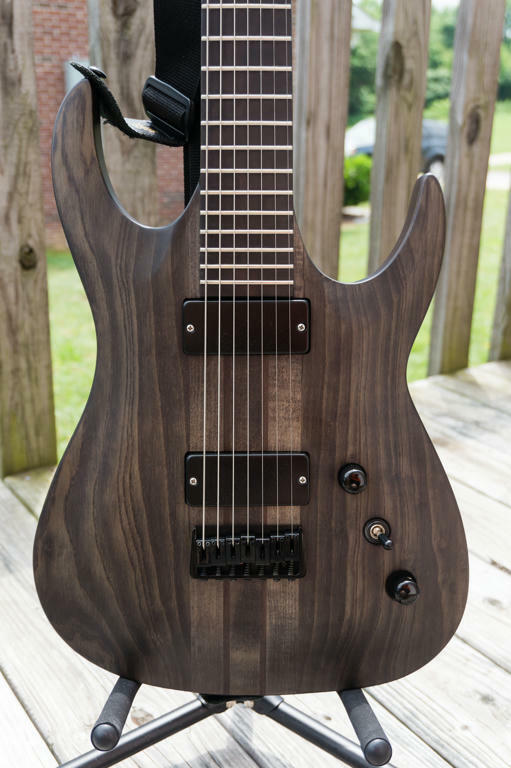 I bought a nice 6-string earlier this year and I may or may not do an NGD on it. 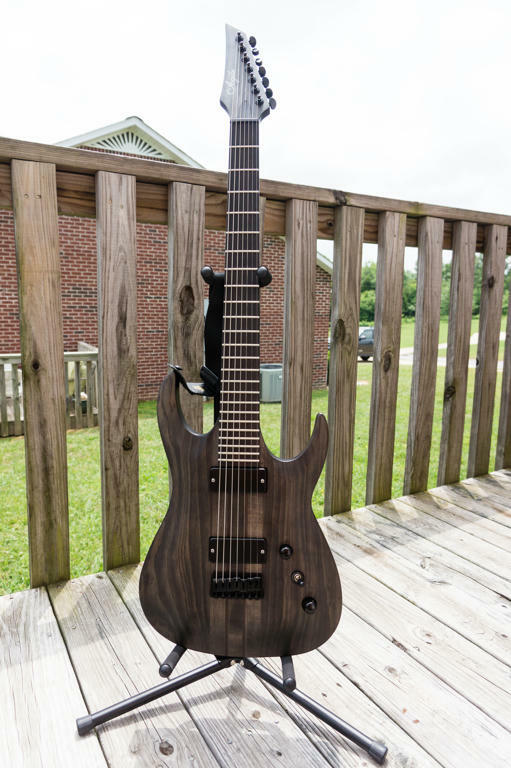 Reason being is because I got my first (and subsequently second and third) seven string and haven't played 6s very much since then. 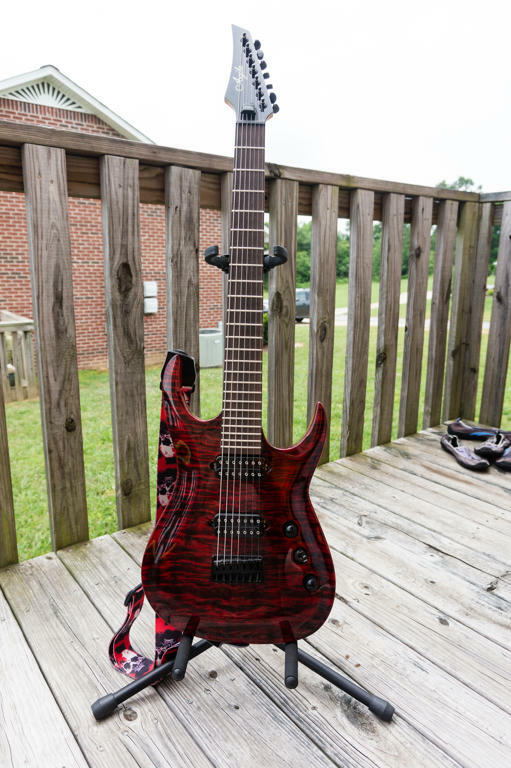 Started off with a mid-level Agile Septor 727 in Tribal Red with a rosewood fretboard. 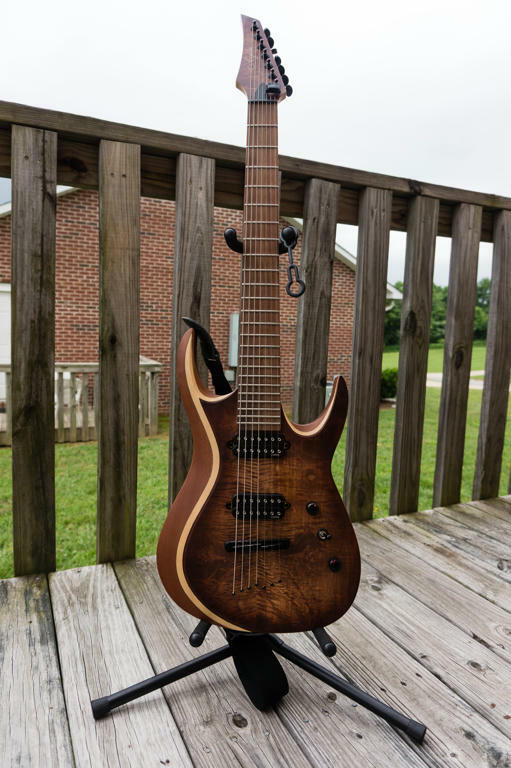 I adjusted really easily to seven strings and knew it was the thing for me. So then I went for a more expensive one. 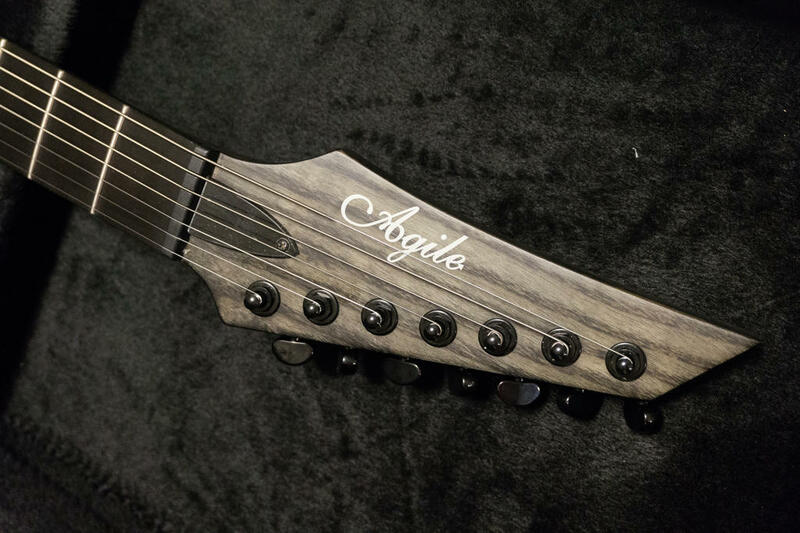 The Agile Septor Pro 728 (28 5/8" scale) with an ebony fretboard. This guitar is perfect. The ebony is amazing (my first guitar with ebony). 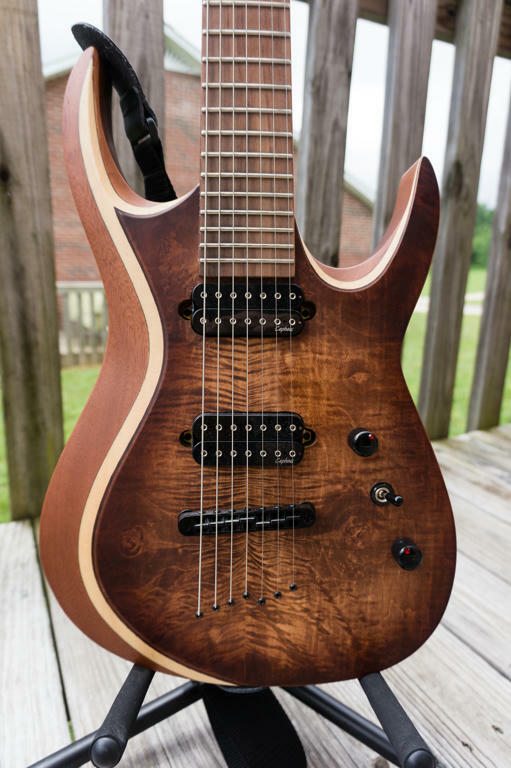 Then I saw another guitar a few weeks later with the layered finish similar to the Ibanez RGDIX7MPB. I opted for the brownburst instead of the blueburst though. I have one extremely minor issue with the Septor Pro, I don't like the color of the screws used on the pickups. I don't understand why they didn't use black but I'll eventually switch them at some point. They just stick out oddly since the rest of the hardware is black. I bought the guitar with Bareknuckle Aftermaths equipped (at an extra cost of course) and I love the bridge but the neck feels very tight and low output so only time will tell if I keep it in there. I'll likely swap the entire set for BKP Juggernauts in a few months. 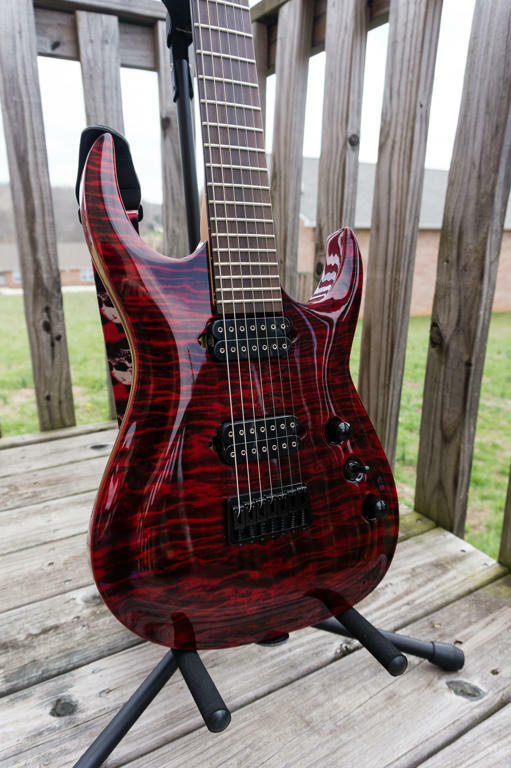 Meanwhile, a set of DiMarzio Titans is probably going into the tribal red Septor. No pickup plans for the Legacy yet though (maybe Fishman's or EMG 57/66 if I keep it?). The stock pickups aren't that bad actually but there's room for improvement depending on your tastes. The necks on all of these are really nice. I saw someone say they were between Schecter and Ibanez or ESP I think and I'd say that's about right. They all feel great and aren't too thick or too thin. Red one was the first guitar, natural charcoal was the second, brownburst was the third. 0rimus, remorse is for the dead, M3CHK1LLA and 10 others like this. Very nice family you have!!! My friend bought that exact same Charcoal 7 string model and we tossed in a BKP Painkiller and Cold Sweat set. That Septor Pro is beautiful man, HNGD! Very nice man!! I especially like the Septor Pro in natural charcoal. Is that ash? I have a similar Septor Elite 727 but in natural mahogany that I just put a Nazgül in the bridge of. I am actually going with my roommate later to a pawn shop for him to pick up a Septor Pro 727 that has Aftermaths. He was conflicted about it since he's not much of a 7 string player but after playing my Septor the other day he was sold and wants one!! Plus it's $289, so you can't pass up that price! !